On Wings of Eagles: The Strength of Hope. TIME magazine once reported a story similar to ones we have heard numerous times before. In this case, it concerns itself with a woman in rural Florida (USA) who was recuperating from a lengthy illness. She enjoyed sitting on her front porch in her wheelchair and, on this day, she sat watching her son work under his automobile. He had raised it on blocks of wood and removed the wheels. Suddenly there was a lurch and the car fell on top of the boy! She screamed for her husband who ran to assist, but he could not budge the car. He climbed into his own vehicle and sped off for help. The mother could hear that her son's groans were growing fainter and she knew she must do something. But how? She hadn't walked in months. Nevertheless, she realized that her son was dying before her eyes and that she was the only one to help. She raised herself shakily to her feet and walked unsteadily to the car. Bracing herself, she lifted. 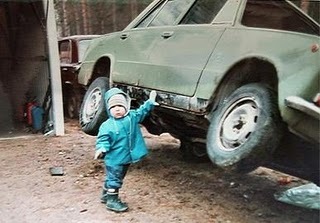 The car raised a few inches, just enough to let the boy scramble free. Then she collapsed. After a thorough examination, she was found only to have suffered strained muscles. But the incredulous doctor's words were most telling: "I will always wonder," he said, "how far she might have lifted that car if she had been well and strong!" Call it a miracle or call it a reserve of strength activated by a tremendous surge of adrenalin -- this mother found what she needed to face the crisis. And so it is with all of us. You have strength, given by your Creator, to overcome seemingly impossible challenges ahead. You may feel weak or unable to cope, but you have been designed with sufficient power to meet those obstacles which may appear insurmountable. Call it what you will, I call it hope. Dear Lord we thank you for the hope we have in you. We pray that we would always keep that hope in our life. In Jesus’ name, Amen.